film’s release, not only is the film now on blu-ray for your to enjoy, but Fox has compiled 50 interesting facts about the film, actors, the true story, the novel and more! In 1943, the Germans opened a maximum-security prison-of-war camp, designed to hold even the craftiest escape artists. By doing so, they unwittingly assembled the finest escape team in military history - brilliantly portrayed by Steve McQueen, James Garner, Charles Bronson, and James Coburn - who worked on what became the largest prison breakout ever attempted. The Blu-ray comes fully loaded with over three hours of special features including commentary with Director John Sturges and crew, multiple making of featurettes, the original theatrical trailer and more. We've also got a GIVEAWAY going on. 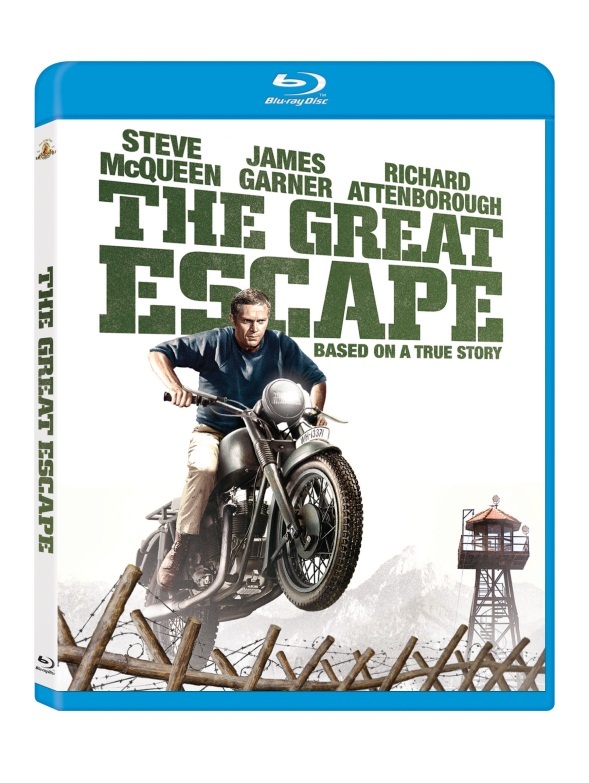 That's right, one of you Just Us Girls readers will be able to win a copy of The Great Escape on blu-ray. Check out the facts below and enter the giveaway following. Good luck! 1. The film spawned a fictionalized made-for-television sequel in 1988. It starred Christopher Reeve and Judd Hirsch. 2. Ferris Webster was nominated for an Oscar for Best Film Editing for THE GREAT ESCAPE. 3. Wally Floody, the real-life "Tunnel King," served as a consultant to the filmmakers during production. 4. The P.O.W. camp Stalag Luft III opened in April 1942 and the Germans considered it to be practically escape-proof. 5. Two games were released based on the real life event - one by Ocean software in 1986, and another by Eidos in 2003 for PlayStation 2 and Xbox. 6. During idle periods in the production schedule, all cast and crew were asked to take strings of black rubber and knot them around other strings of black rubber. The finished results of this were the coils and fences of barbed wire seen throughout the film. 7. When filming the train sequences, a railroad representative had to be on hand to tell the filmmakers when to pull aside to avoid hitting scheduled oncoming trains. 8. In real life, none of the prisoners escaped via motorcycle or aircraft. 9. The book’s author, Paul Brickhill, participated in the escape plan but was debarred from the actual escape due to claustrophobia. 10. Most of the planes in the airfield are actually American AT-6 Texan trainers, but painted with a German color scheme. 11. Actors Rupert Davies, Cy Grant and Peter Butterworth were all real life prisoners in Stalag Luft III. 12. Many of the prisoners at Stalag Luft III we recaptured escapees. 13. In real life, a number of friendly guards helped supply prisoners with railway timetables, maps, and official papers required to allow them to be forged. 14. Charles Bronson had been a coal miner before he started acting – so he brought some real life experience to the set as the chief tunneler! 15. Some TV versions of the film edit the scene in which Ives is shot and killed for trying to escape over the fence. 16. James Garner used his own personal experiences in the military during the Korean War as inspiration for his “Scrounger” character. 17. The film shows almost everything happening in the summer months when, in actuality, the actual escape occurred in March while there was still snow on the ground. 18. In September 1943 the entrance to "Tom" became the 98th tunnel to be discovered in talag Luft III. 19. When the Bavaria Studio's backlot proved to be too small for production, the team obtained permission from the German government to film in a national forest adjoining the studio, and reseeded about 2,000 small pine trees after shooting wrapped! 20. Author Paul Brickhill was piloting a Spitfire aircraft that was shot down over Tunisia in March 1943 when he was taken to Stalag Luft III. 21. The motorcycle that Hilts rides is a modified Triumph TR6 Trophy. These British motorcycle models were not in existence during WWII, and their appearance is somewhat incongruous! 22. Aside from the Triumph, there are a few other historical anachronisms in the film, including post-war traffic signs, an incorrect railroad logo, and more. 23. The film chose to focus on American P.O.W.s, but in actuality, the escapees were British and Empire personnel. None were actually American! 24. Bud Ekins, Steve McQueen’s stunt rider, made his first appearance as a stuntman in THE GREAT ESCAPE. 25. The actual tunneling and escape preparations took 600 men over a year to accomplish. 26. Steve McQueen's character, Hilts, was actually based on amalgamation of several characters, and not just one person. 27. The motorcycle used by Steve McQueen is the same motorcycle Henry Winkler used on "Happy Days." 28. Stalag Luft III was liberated on January 27, 1945. 11,000 remaining prisoners left that night. 29. Following the escape, the Germans took an inventory of the camp and discovered that 4,000 bed boards had gone missing. This was just a fraction of the materials that were ultimately found to have been used in the escape. 30. The gold medallion Steve McQueen wears in the film was a present from his wife. 31. During the climatic motorcycle chase, John Sturges allowed Steve McQueen to ride as one of the pursuing German soldiers. This means that, with some help from the editors, McQueen was chasing himself! 32. Seven P.O.W.s returned to Stalag Luft III in 2009 for the 65th anniversary of the escape, and were shown the film. 33. Steve McQueen, James Coburn, and Charles Bronson all previously starred together in another John Sturges movie - The Magnificent Seven. 34. The film was shot at Bavaria Film in Germany. Other films made here include The Sound of Music, Willy Wonka & the Chocolate Factory, and Cabaret. 35. John Leyton who played Willy, the Tunneler, was one of the most popular UK pop singers in the early '60s. 36. Actor David McCallum’s daughter, Sophie, has never been able to watch the film because she can’t stand to see her father shot. 37. Several members of the cast and crew were caught in a speed trap set up by German police near the set. Steve McQueen was even arrested and briefly jailed! 38. The film is accurate in showing that only three escapees actually got out, although the people who made them differed from those in the film. 39. This was one of the highest grossing films of 1963! 40. Although only 3 men managed to escape, the escape caused havoc among the Germans. Thousands of police, Hitler Youth members and soldiers were diverted from wartime duties to search for the escapees. 41. Cast members Donald Pleasence, Hannes Messemer, Til Kiwe and Hans Reiser were all actual P.O.W.s in WWII. 42. Donald Pleasance is the only actor to appear in both this film and the 1988 TV movie. 43. In real life, the shooting of the recaptured escapees was one of the charges at the Nuremberg War Crimes Trial of Hermann Göring and other Nazi leaders. 45. Another escape also occurred at Stalag Luft III – it’s depicted in 1950’s The Wooden Horse. 46. There are only two surviving P.O.W.s from Stalag Luft III; Ken Rees and Gordon King. 47. During production, Charles Bronson met and fell in love with David McCallum's wife, Jill Ireland. On set, he jokingly told McCallum he was going to steal her away. Four years later, Ireland and McCallum divorced, and she married Bronson. 48. The iconic motorcycle scenes in the film were not based on real life or the novel, but were added at Steve McQueen's suggestion. 49. Real P.O.W.s asked filmmakers to exclude details about the maps, papers, and tools hidden in gift packages from their home countries, as it might jeopardize future P.O.W escapes. The filmmakers, of course, complied. 50. The actual escape that the film is based on occurred on March 24, 1944 - which was Steve McQueen's birthday!